For all owners of wind farms, Predictail Othello is a game changer that reduces the costs of maintaining turbines. Unlike SCADA systems, Othello analyzes correlations between data from all existing sensors in relation to history and the entire population. Thanks to that the wind farm owner knows when and what needs to be serviced to avoid a serious and costly failure. Predictail Othello will provide you information in the form of a short report before the planned maintenance so that you know which place you need to check very carefully and save the money. For the management that needs quick and accurate information about the state of the farm, we have prepared “Anomalies summary”. Maintenance engineers need parameters and values. In the descriptive part, all detected anomalies are described in detail. We serve many different farms. There are many different cases of failure in our database. We will give you recommendations based on a population much larger than your farm. Predictail Othello provides us with knowledge of what to check in a turbine that you do not read in SCADA. We saved money on the “loss of profit” insurance and we are sure that we will not be surprised by the downtime. Predictail Othello helped us find the cause of underperformance. Thanks to the information from the analysis, we were able to tell the producer which element causes underestimated production. Predictail Othello is a service that Predictail provides for windfarm owners and operators. 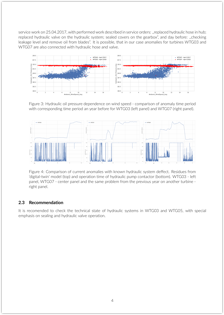 We search for anomalies in measurements downloaded from turbine SCADA system (Supervisory Control And Data Acquisition) and we describe them in the form of a report. Our clients can use this information to make their maintenance very effective, thus increase total availibility and energy production. What is the result of Predictail Othello service? 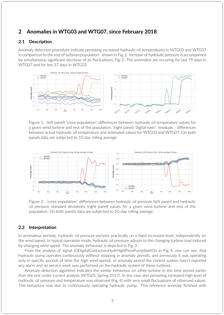 The result of Predictail Othello service is a PDF document – a report of anomalies. We have calculated that statistically, wind farm owners tend to lose around 40 000 Eur of profit per year per 10 turbines because of unplanned stoppages longer than 6 hours. Using Predictail Othello analysis results one can prevent those stoppages and significantly reduce loss – by even more than 60%. So, yes – it does pay off. There is no wind farm that has perfect availability – is always can be better. How do you find anomalies in SCADA data? “digital-twin” – it is used to find out if given component is behaving in a different way than it used to. One can think of it as a simulator trained to reproduce what is a typical response of a given component. For example, we can detect that generator bearing temperature is higher than it used to be in particular environmental conditions like wind speed and ambient temperature. “cross-population” – it is used to find out if a given component is behaving in a different way than the rest of the population. For every measurement sample, we use data from the rest of the turbines to approximate what is an expected response of a given component. 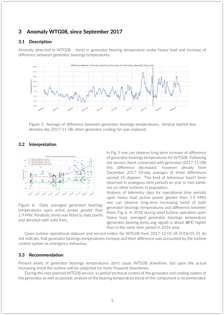 For example, we can detect that generator bearing temperature in a given turbine is higher than in a group of most similar turbines in a wind farm population. “intra-component” – it is used to find out if given component is behaving in an internally consistent way. For example, using this model we can detect that temperatures of three generator phases are not correlated anymore, thus one of the sensors can be broken. For one turbine we use ~20 digital-twins, ~80 cross-population and ~9 intra-component models (numbers depend on the turbine model). We use an automatic scoring procedure to rate the importance of anomalies and select those to be described in the report in detail. I pay for producer’s maintenance program, should I still order Predictail Othello? Yes. We have clients that order Predictail Othello despite having an availability guarantee agreement – they treat our service as a 3rd party audit of what is the technical state of their turbines. Also, one can use our list of anomalies to create service tickets for producer’s maintenance. What types of turbines can you analyse? So far we analysed SCADA data from Vestas, Siemens, Senvion and GE turbines and we are open to analyse any other without additional charge. Algorithms used by Predictail are very generic, they just need to be tuned when we approach a new type of turbine. What kind of data do you need to perform Predictail Othello service? How can I transfer you the data? You can transfer us data downloaded from SCADA in .csv files via FTP or any other medium that is convinient to you. We can also use OPC or ODBC protocol to download the data from SCADA for you. How often should I order Predictail Othello? We recommend to order our at least analysis twice a year – before every scheduled maintenance, so technicians can use our report during service. I have CMS system, a vibration monitoring - do I still need Predictail Othello? Vibration analysis based systems like CMS are complementary to Predictail Othello – those systems monitor vibrations, while Predictail Othello is used to analyzing all other signals like temperatures, pressures, RPM’s and currents. We recommend using both of solutions in parallel! Can Predictail analyse condition of the turbines online? 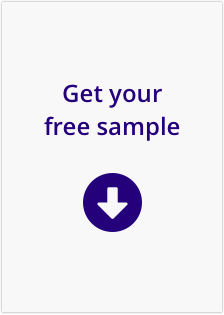 We will release an online analysis software tool in 2019 – if you are interested, let us know! How many turbines did you analyse so far? So far we analysed data from 252 turbines, 4+ years history each – it’s over 1000 turbine-years!